Build corporate spirit and boost employee morale within your organization! “XYZ Company” contacted our rental department for a long term forklift rental. Based on the length of term, we were able to offer the client an option to customize the forklift to their liking. We had a lot of fun customizing the unit, as Central Florida is mostly a “Gator Nation” it was an easy choice. The units were well received by the customer. Mark, who is in charge of operations, immediately noticed an upbeat mood among his forklift operators. 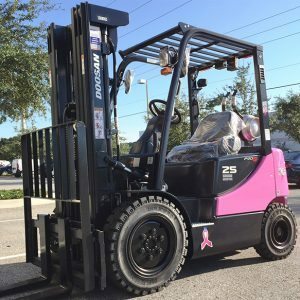 He is grateful Jamco was able to deliver an exciting forklift rental experience which resulted in improved spirit and morale within the organization. 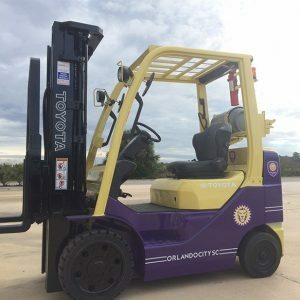 The project has extended Jamco’s forklift rental program to develop custom branding with your company’s colors and logo on any long-term rental. We feel it is important for a forklift operator within the company to enjoy and take pride in their work. A customized forklift assists in building your corporate brand and makes the company proud to see their own forklift around the facility. It’s like having a mascot! “Lowest price should never be the determining factor. My role as head of the rental department is to make sure the customer receives a wonderful experience when doing business with Jamco. 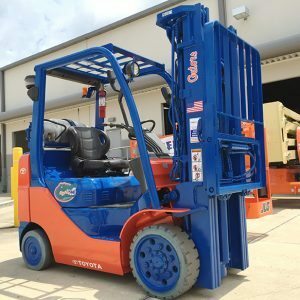 Our mission is to deliver top class, newer model forklifts that are reliable and enjoyable to operate with a competitive price,” says Carol Fontanez. All too often we receive a call from a customer who decided to book the lowest price in the market, only to realize when the forklift is needed it’s non-operational and broken down. Call Jamco today – 1-866-848-5400 – to find out more about a custom painted lift truck rental.